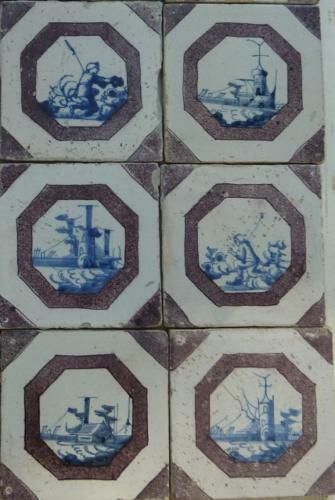 A set of thirteen octagon styled Delft tiles each painted with buildings and rural scenes in manganese, circa 1720. Delftware pottery and tiles were in great demand during the seventeenth and eighteenth centuries. The term delftware is generally used to describe functional and earthenware pottery covered with an opaque white tin glaze on which decorations have been painted in blue and polychrome. We have sourced a range of antique Delft tiles, plates and other objects from the 17th, 18th and 19th centuries. These have been reclaimed and make an outstanding feature as a mixed collection or individually. The tiles vary in subject matter and have been hand crafted. We have a selection of tiles in stock and can source others as required.